Paradoxology: Spiritual Wisdom from Dan Brown? Spiritual Wisdom from Dan Brown? Some people consider Dan Brown, author of The DaVinci Code and Angels and Demons to be nothing more than a Catholic-bashing, Christian-hating pagan. And if all that's true, it makes the impassioned speech delivered by one of Brown's characters in Angels and Demons all the more remarkable. So when you've got 10 min. to spare, read the following excerpt and then leave your impressions or comments concerning the cultural-spiritual insights contained in this amazing speech penned by the author. "Medicine, electronic communications, space travel, genetic manipulation ... these are the miracles about which we now tell our children. These are the miracles we herald as proof that science will bring us the answers. The ancient stories of immaculate conceptions, burning bushes, and parting seas are no longer relevant. God has become obsolete. Science has won the battle. We concede." us. And it has cost us deeply." "Science may have alleviated the miseries of disease and drudgery and provided an array of gadgetry for our entertainment and convenience, but it has left us in a world without wonder. Our sunsets have been reduced to wavelengths and frequencies. The complexities of the universe have been shredded into mathematical equations. Even our self-worth as human beings has been destroyed. Science proclaims that Planet Earth and its inhabitants are a meaningless speck in the grand scheme. A cosmic accident." He paused. "Even the technology that promises to unite us, divides us. Each of us is now electronically connected to the globe, and yet we feel utterly alone. We are bombarded with violence, division, fracture, and betrayal. Skepticism has become a virtue. Cynicism and demand for proof has become enlightened thought. Is it any wonder that humans now feel more depressed and defeated than they have at any point in human history? Does science hold anything sacred? Science looks for answers by probing our unborn fetuses. Science even presumes to rearrange our own DNA. It shatters God's world into smaller and smaller pieces in quest of meaning ... and all it finds is more questions." …"The ancient war between science and religion is over," the camerlengo said. "You have won. But you have not won fairly. You have not won by providing answers. You have won by so radically reorienting our society that the truths we once saw as signposts now seem inapplicable. Religion cannot keep up. Scientific growth is exponential. It feeds on itself like a virus. Every new breakthrough opens doors for new breakthroughs. Mankind took thousands of years to progress from the wheel to the car. Yet only decades from the car into space. Now we measure scientific progress in weeks. We are spinning out of control. The rift between us grows deeper and deeper, and as religion is left behind, people find themselves in a spiritual void. We cry out for meaning. And believe me, we do cry out. We see UFOs, engage in channeling, spirit contact, out-of-body experiences, mindquests-all these eccentric ideas have a scientific veneer, but they are unashamedly irrational. They are the desperate cry of the modern soul, lonely and tormented, crippled by its own enlightenment and its inability to accept meaning in anything removed from technology." Mortati could feel himself leaning forward in his seat. He and the other cardinals and people around the world were hanging on this priest's every utterance. The camerlengo spoke with no rhetoric or vitriol. No references to scripture or Jesus Christ. He spoke in modern terms, unadorned and pure. Somehow, as though the words were flowing from God himself, he spoke the modern language ... delivering the ancient message. In that moment, Mortati saw one of the reasons the late Pope held this young man so dear. In a world of apathy, cynicism, and technological deification, men like the camerlengo, realists who could speak to our souls like this man just had, were the church's only hope. The camerlengo was talking more forcefully now. "Science, you say, will save us. Science, I say, has destroyed us. Since the days of Galileo, the church has tried to slow the relentless march of science, sometimes with misguided means, but always with benevolent intention. Even so, the temptations are too great for man to resist. I warn you, look around yourselves. The promises of science have not been kept. Promises of efficiency and simplicity have bred nothing but pollution and chaos. We are a fractured and frantic species . . . moving down a path of destruction." The camerlengo paused a long moment and then sharpened his eyes on the camera. "Who is this God science? Who is the God who offers his people power but no moral framework to tell you how to use that power? What kind of God gives a child fire but does not warn the child of its dangers? The language of science comes with no signposts about good and bad. Science textbooks tell us how to create a nuclear reaction, and yet they contain no chapter asking us if it is a good or a bad idea. "To science, I say this. The church is tired. We are exhausted from trying to be your signposts. Our resources are drying up from our campaign to be the voice of balance as you plow blindly on in your quest for smaller chips and larger profits. We ask not why you will not govern yourselves, but how can you? Your world moves so fast that if you stop even for an instant to consider the implications of your actions, someone more efficient will whip past you in a blur. So you move on. You proliferate weapons of mass destruction, but it is the Pope who travels the world beseeching leaders to use restraint. You clone living creatures, but it is the church reminding us to consider the moral implications of our actions. You encourage people to interact on phones, video screens, and computers, but it is the church who opens its doors and reminds us to commune in person as we were meant to do. You even murder unborn babies in the name of research that will save lives. Again, it is the church who points out the fallacy of this reasoning. "And all the while, you proclaim the church is ignorant. But who is more ignorant? The man who cannot define lightning, or the man who does not respect its awesome power? This church is reaching out to you. Reaching out to everyone. And yet the more we reach, the more you push us away. Show me proof there is a God, you say. I say use your telescopes to look to the heavens, and tell me how there could not be a God!" 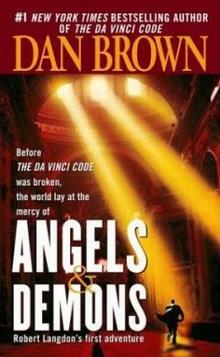 1 Dan Brown, Angels and Demons, New York: Atria Books, 2000, pp.341-344. I'm always some what shocked by the phobia around Dan Brown's book, almost like, " if you crack the cover on one...you might catch something." We had an evening of conversation around the Da Vinci Code in our Cafe'...it made for some great discussion, and an avenue to engage people who are reading the book and struggle with faith. Just reading the excerpt of Angels and Demons...what a great way to enter in to conversations around faith and science, ceritude and mystery. I say lets not live in fear...lets use the stuff for our advantage. 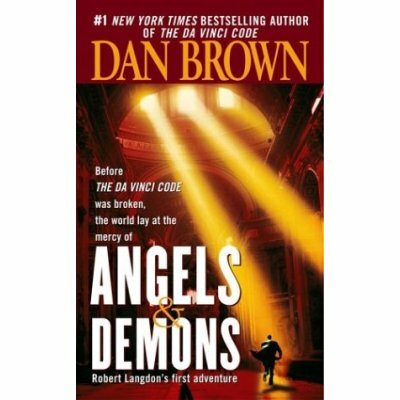 I'm sorry to say that although Angels and Demons is the best of his novels IMO they are poorly written, poorly researched airport pulp fiction - I humbly suggest that if they didn't have religion as a core theme they wouldn't have even registered on the literary scale. I did try to give him the benefit of the doubt and have read 4 of his books (not sure if there are any more) but they got worse and worse, the puzzles easier to solve (though the weak characters he paints seem incomprehensibly incapable of doing even a tea-break crossword!) and the plots are all the same! I do not know about any other of this author ‘s writings. I have seen some reports on the history channel ( I think) on the historical implications of Di Venice (spell) code. The section posted has questions needing answers answers that the Church for the most part is impotent to answer. Is science the study of Yahweh’s creation giving us more understanding of who He is, or has science become a god provision for man.the speaker in his diatribe poses these questions. We, the Church must answer these because the world around us and the population within it are guided by - to these questions. This “nutter” should be eating honey and locusts and wearing camel hair and resounding by the rushing water REPENT THE KINGDOM OF GOD IS AT HAND!!!!! I read this book for the first time over the summer, and I really loved it. I think it's funny that most Christians cast his books aside, when we really could use them to our advantage. I actually just used a quote from this in my Apologetics paper... the "you ask what does God look like" part. I don't agree with the claims that these books poke holes in the Christian faith... I think they do a great deal to strengthen it. i love angels and demons so much..specially the speech of the camerlengo.. I'm also a religious person but i don't know why i adorned this book that much.. why not try to understand the real meaning of his speech. Watched A&D over the Christmas break, and I can say without reservation that your review knocks this right on the head. Spot on Mr Sanchez. Spot on!